Google Drive, Google’s online storage service is finally available after years of rumors, but with Microsoft’s SkyDrive offering more space and better integration with Windows 8, is Drive really worth the wait? After comparing the two services, Google Drive emerged as the winner, based on four reasons. Let’s take a look at them. 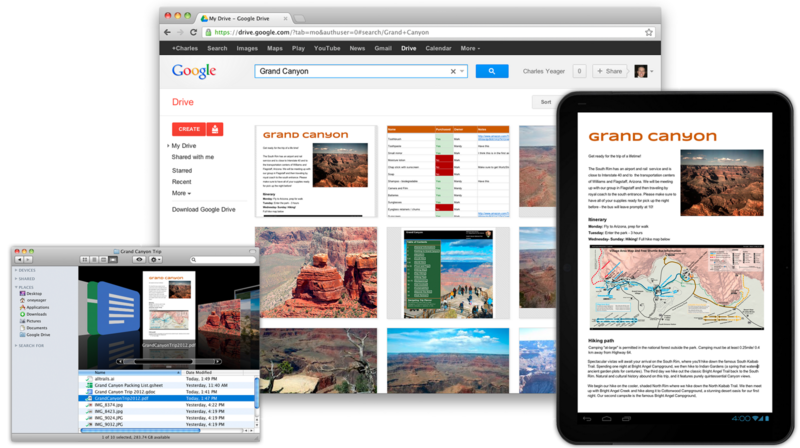 Google has a six-year head start on Microsoft’s Web Office with Google Docs. Docs has a clean interface with commonly used features in a small menu bar at the top of the screen. Web Office brings the “ribbon” interface from the desktop Office to the Web, making things cluttered. Docs makes it easy to save documents in a variety of formats including Word, while Web Office’s documents are saved only in Office formats. Docs loads completely in less than five seconds but it takes Web Office takes two to three times that to load. Search is a pain with SkyDrive as it only peers into documents in Office file formats. Google Drive’s search is far more advanced: in addition to Office formats, search works in any format Google Docs can save to (ODF, PDF, TXT). Character recognition makes scanned content -- like newspaper clippings -- just as searchable. The same goes for photos. My colleague Ian Paul noted some flaws in the image search function, but he rightly points out that Google says the image recognition technology is in its early stages and should improve over time. In order to view media files from SkyDrive, you will have to download them first. Google Drive has a great feature that generates a preview any time a video is uploaded. Videos are then streamed from Google’s service when viewing them on Google Drive. Google does not allow the same for MP3 files: those must be downloaded. I am going to assume that this has something to do with record industry concerns, but at least Google isn’t blocking the file type from being shared. Google Drive users are given a variety of capacity options to suit their needs. The cheapest is 25 GB for $2.49 per month. Additional storage options are available to 16 TB, although that sets you back $800 each month. There’s an added bonus to all this space: Gmail accounts gets 25GB of storage, and any unused space can also be used for photos you may have stored in Google’s Picasa photo service. SkyDrive offers 20 GB of storage for only $10 a year, a cheaper entry price, but it caps its storage at 100 GB for $50 a year.